The Secret Beach Fish Villa have long been a favorite of the Mayan Riviera, and for some good reasons. The Secret Beach Villas are actually three luxury Identical Beach-Front villas all 4 or 5 bedrooms each with it's own private pool, part of a three villa building; You can rent one or two or all three villas if you have a bigger group of up to 32 people. We have been renting our villas since 1997, we have everything you need from an on-site property manager, to extras like Central A/C, Wifi, Free Phone Calls anywhere, USA satellite TV (80+ channels) just like back home in English, so you won't miss the next Survivor or CSI episodes. You would be hard pressed to think of amenities that we don’t have in the villas. We have extensive list of excursions to offer you as well as maps to local shopping and restaurant suggestions. Unlike many villas in the area we are ONSITE OWNERS who manage their own vacation home, we are only 300 feet away if you need us. We have become an intuition in the area, one of the 1st to offer beachfront villa rentals more than 20 years ago - 70% of our guest are repeat customers. We make your Vacation Hassle Free: The 1st thing every guest says when they arrive, is the Villa & Ocean are more beautiful than even the pictures show, with the ocean's edge 30 feet from the back door, you always have a great view of the turquoise water of the Caribbean. We furnished our villas with real living room furniture all imported from Pottery Barn or Macys. In our villas we want you to feel like your home. We have all the information and assistance to help make planning your vacation hassle free. We have downloadable maps to Costco, Wal-Mart in Playa del Carmen & Cancun and Hospitals. You can go online thru our site and view videos of activities and reserve online, including Golf Tee Times or a Catamaran trip to Isla Mujeres, and Fishing and Snorkeling in Puerto Morelos. Our FAQ have every question you could think of including a Mayan Riviera Swine flu update. We offer a grocery shopping service that will buy all your grocery’s and have them waiting in the villa for you. Chef Miguel & Welcome Dinner Menu: The villa owner is a professional chef and will cook your food with the 'Sazon y Sentimiento' (Taste and Feeling) of Mexico, for the 'foodies on vacation' you can schedule an afternoon private cooking class with Chef Miguel. Here is our Welcome dinner we offer arrival night so guest can relax and get their bearings without having to go out to a restaurant to eat. One of the many dinners on our villas food service menu. All meals come with a pitcher of Margaritas or Pina Coladas or Sangria. Meals run $18 - $24. Not up for dinner, we also offer 'Happy Hour' munchies and we deliver them right to you, so you can snack at the pool. Kids under 5 eat for Free, kids 5 to 11 eat 1/2 price. Chef Miguel and Private Cooking Class: Chef Miguel will come to your vacation villa and teach you the in and outs of some of the popular Mayan Dishes along with hands on training... be prepared to be involved with the food preparation as Miguel’s Suez Chefs or grab a stool with a margarita or a cerveza and just watch. It’s a fun and festive afternoon preparing a Mayan dinner along with insights to both Mexican/Mayan Ingredients as well as Cultural viewpoints… afternoon of pure Foodie heaven! You don’t have to be a seasoned Chef…or you could be… but either way you learn recipes that you can easy make back at home. After the cooking is done sit down to a memorable Mayan dinner you have just prepared. You can go to Chef Miguel's website Cancun Chef and learn about his passion for food. Miguel is a real 'Foodie' and loves nothing more than to talk food the villa guest, many of whom are chefs themselves. This last year he spent a month in Southeast Asia taking cooking classes in Thailand, Vietnam and Taiwan. Hello let me introduce ourselves. My name is Liza and my husband is Miguel, and we are the owners of the Secret Beach Villas since 1997. We got in to the Villa Rental Business quite by accident. We had traveled to Playa del Carmen on a few occasions for vacations. One trip while doing some exploring we decided to check out a road we saw off the main highway. To make a long story short, we found Playa del Secreto, fell in love with it, we bought a villa and decided to rent out when we weren’t using it. We moved from the cold of Metro Detroit in 1999 to live full-time in the warmth of the tropics. Miguel is a professional Chef and cooks for our guest if requested. He has several years of management experience with Club Med - he speaks French, English, Spanish and Italian. Miguel is a Mexican native whom lived in the States for years, he is a real people person (which sorry to say I am not, I’m the computer Geek.) He enjoys fishing and is a real Foodie, we take a lot of Culinary vacations. take a look at our Homeaway reviews and you can read his Passion for food I owned an Engineering Consulting company in Metro Detroit that specialized in the statically analysis of automotive Camshafts and Crankshafts for the big 3. I traveled all over the world crunching numbers for the big 3 auto companies. Check out my Blog “Getting it Done” in the Mayan Riviera… Life, Work and all the Guest Luggage!!! On the Beach - villa has floor to ceiling wall to wall door walls - you can see the beach and the ocean even from the kitchen! We are located on a beautiful Beach called Playa del Secreto with only 20 other villas, the water edge is only 50 feet from your back door, why stay at a resort when you can have your own beach. 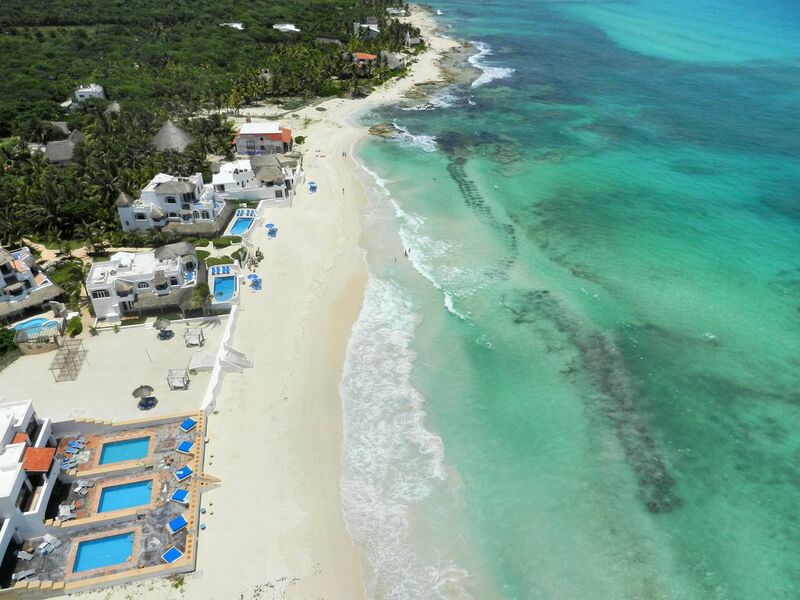 One of the most beautiful beaches in the Mayan Riviera - walk on the sliding patio door and you're right on the beach - float in the pool and the ocean is right there. Both a Mexico line and a USA Vonage line along with a PBX system so all the villas and services are easily reached. Phone calls are FREE! all high end - 500 thread count - are imported from the Company Store. villa has private carport - grounds have room for extra parking all behind a secure gate . lots and lots of bath towels and beach towels. floor to ceiling double doorways with a great view! Kitchens have been remodeled spring 2016 - new granite countertops, Imported garbage disposal and range vent hoods - stainless steel appliances. New dishware, flatware and large pot and pan set. also and outside dining area seats 10+ living room dining table is big enough for 10 + the bar area with chairs seats 3 people 6 feet from dining table. 46" TV with Dishnetwork (all in English) in the living room and a 32" TV to the master bedroom upstairs - don't miss the next Dance with the Stars or NCIS or local news while away! It’s a great house for vacation with your family. Great location and great service. maids do a great job and the grounds and pool are immaculate! We ordered a couple of meals from Beto which arrived promptly and were delicious. with great places to eat , a vibrant market and very friendly people. All in all, a terrific holiday, and we all want to go back. Sorry you were unfortunately arrived just after the Seagrass (Sargasso) also arrived. It lasted 3 weeks this time. All is is gone now. This was explained to you as not an ongoing problem, for the 20 years we have had the villas we did not have Sargasso, then about 4 years ago the Mayan Riviera/Cancun (even Florida) got hit bad, we had for months (Mexico Government came in to clean the whole coast), since then WE HAVE IT A FEW TIMES A YEAR FOR ONLY A FEW WEEKS EACH TIME. The staff worked hours each day raking and burying the Sargasso, so the beach was clean for our guest. We are lucky in Playa del Secreto that we get very little of of the Sargasso because we do not have a reef in front of us and our beach is rather straight (not a bay shaped) so the Sargasso doesn’t get stuck in our area, the ocean stream moves it further down the coastline. i hope you had a great flight back to the UK. The fish villa is a beautiful property in this secluded yet close to everything private beach. The house has everything you need to enjoy a great beach stay, although it has small details very easy to fix with some more dedicated maintenance. I definitely recommend it and will return, we had a fantastic time! The perfect get-a-way for a large close family! We had a wonderful time at the beach house!!!! The owners were very helpful and friendly.. The meals from the chef were better than great! Love to stay again! love to have you again. I will pass the review to Chef Miguel & Beto! Perfect for large family with children! What a great location and helpful staff! We came during the time of seaweed but it wasn't really a problem. In fact we found this beach was the best. There is not much to see snorkeling but we did see a ray and some fish. The kids enjoyed boogy boarding. The house was very nice and the pool just big enough. Chef Miguel and Beto make fantastic meals upon request. You'll love the local pets Luna and Coco. Golf: The Mayan Rivera is the fast becoming a world renowned golf destination. Some of the top golf course designers such as Greg Norman and Jack Nicklaus have brought their resources to Mexico and have built some remarkable golf courses; both the PGA and the Canadian PGA both have annual tournaments here. The Secret Beach Villas are as close as Five to Twenty-Five minutes from these championship courses.